Grows into a heart-shaped pattern of 21 bulbs to flower next Spring, and every Spring afterwards. Supplied a single heart-shaped pack of 21 bulbs in biodegradable packaging carrier. 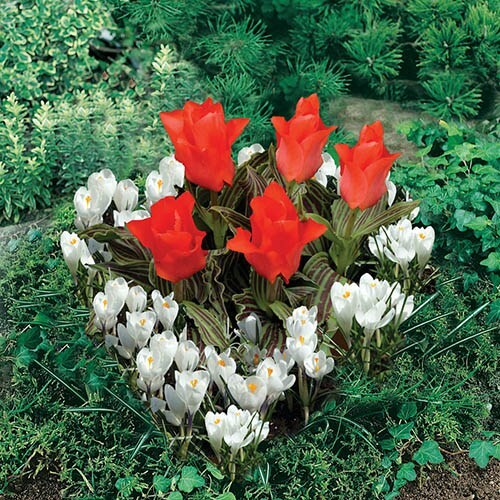 Plant Sep-Jan.
What could be easier than the perfect romantic gesture, or long-lasting sentiments, this unique pre-filled heart-shaped planter features pre-spaced Red Tulips and white Crocus. Simply plant the whole tray into the ground or a pot - wathc the helpful video to see how. You cannot get easier gardening than this for flowers next Spring and for years beyond. Supplied is a pre-positioned pack of 21 bulbs, in heart shape, plant whole pack in pots or garden soil.